Browse » Home » United Kingdom » Tune Hotel Rooms from RM1, Rp10,000, THB169, PhP208, GBP20! 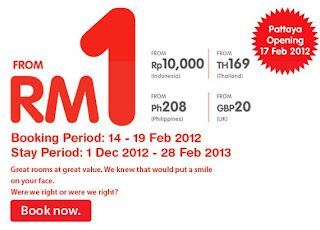 Tune Hotel Rooms from RM1, Rp10,000, THB169, PhP208, GBP20! Book Early Online - Pay Less! Pattaya Opening on 17 February 2012! Visit Tune Hotels to book your room now!